The Cassin’s Auklet, Ptychoramphus aleuticus, can be found from midway up the Baja California peninsula to Alaska's Aleutian Islands, off North America. They nests on offshore islands, with the main population stronghold being Triangle Island off Vancouver Island's Cape Scott, where the population is estimated to be around 550,000 pairs. It is not known to be migratory, however, they northern birds may move farther south during the winter. 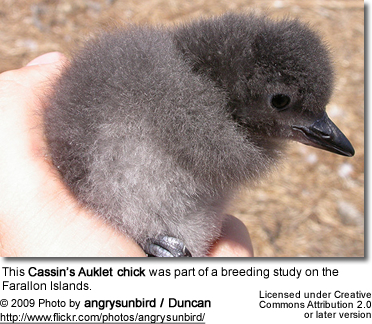 The Cassin's Auklet is a small, chunky (25 cm, 200 g) auk. The plumage is mostly dark above and pale below, with a small white mark above the eye. Its bill is overall dark with a pale spot, and its feet are blue. The Cassin's Auklet lacks dramatic breeding plumage that most other auks develop - instead its plumage remains the same over most of the year. 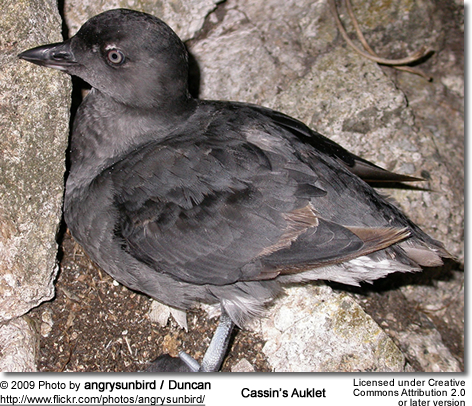 The Cassin's Auklets nest in small burrows on small islands. In the southern area of its range, they may be found in the breeding colony throughout the year. When building their nest, they either digs holes into the soil or they use natural cracks and crevices to nest in. At times, they may use man-made structures. The monogamous pairs typically use the same nesting site for many years. Both the parents incubate the clutch, which consists of one single white egg. They returning to swap shifts at night to avoid being taken by predators such as the Western Gull or Peregrine Falcon. The egg is incubated for 40 days. The small chick is fed nightly for 35 days by both parents, who bring regurgitated food in a special gular pouch. The chick fledges alone and makes its way to the sea. 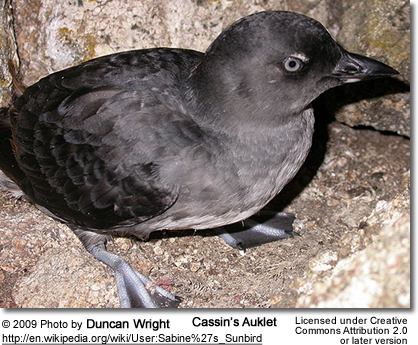 The Cassin's Auklets typically forage offshore, in clear often pelagic water, hunting for large zooplankton, particularly krill. They feed by diving underwater - beating its wings for propulsion. It can dive up to 30 m below the surface - some estimate 80 m.